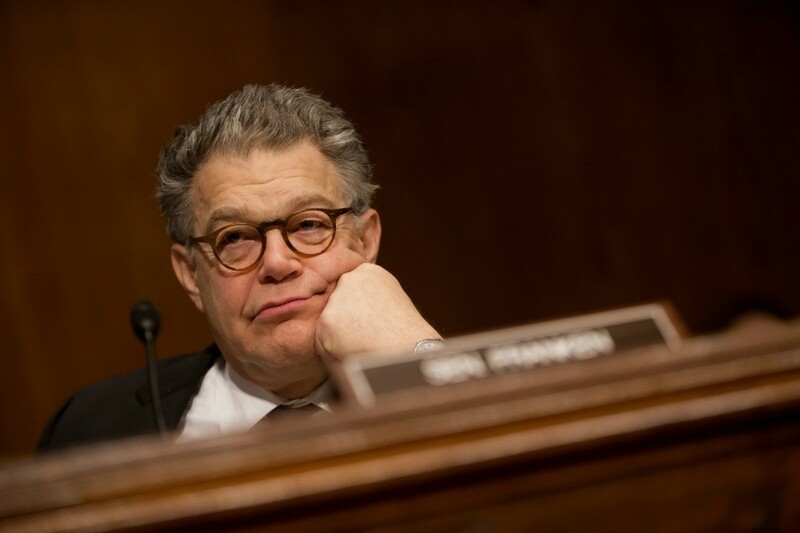 Sen. Al Franken (D-Minn.) during a hearing on Capitol Hill in Washington, April 5, 2017. WASHINGTON — Eleven Senate Democratic women — and multiple Democratic men, including the Senate’s second-ranking Democrat — called for Sen. Al Franken to resign Wednesday, after a sixth woman came forward to charge that the Minnesota Democrat had made an improper advance on her. “Enough is enough,” declared Sen. Kirsten Gillibrand of New York. Franken scheduled an announcement Thursday on his future in the Senate. That future does not look bright. Gillibrand was joined by Mazie Hirono of Hawaii, Claire McCaskill of Missouri, Patty Murray of Washington, Kamala Harris of California, Tammy Baldwin of Wisconsin, Debbie Stabenow of Michigan, Maria Cantwell of Washington, Heidi Heitkamp of North Dakota, Tammy Duckworth of Illinois and Maggie Hassan of New Hampshire, who issued statements in a coordinated effort. Sen. Richard J. Durbin of Illinois, the No. 2 Democrat, added his support, as did Sens. Bob Casey of Pennsylvania, Joe Donnelly of Indiana, Patrick Leahy of Vermont, Edward J. Markey of Massachusetts and Sherrod Brown of Ohio, and Tom Perez, chairman of the Democratic National Committee. Gillibrand started the avalanche with an extended statement on Facebook. Franken has apologized for his behavior, but the senators said his admissions are not enough. “We must not lose sight that this watershed moment is bigger than any one industry, any one party, or any one person,” Gillibrand said. That was followed in rapid succession with other statements. Hirono said the effort was indeed coordinated.